An 8-foot-high pressure ridge at Tabernacle Hill. Many of the ridges here are hundreds of feet long. 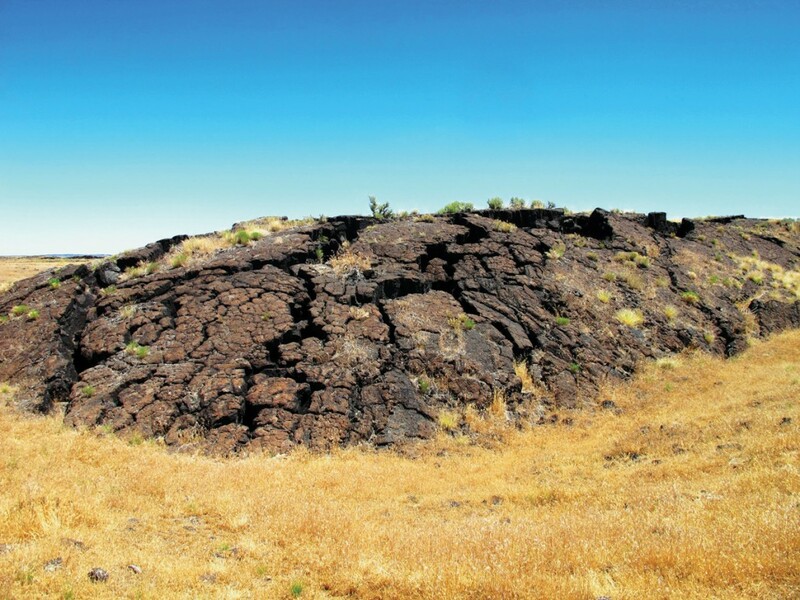 The Black Rock Desert is a volcanic area, or volcanic field, covering more than 700 square miles in eastern Millard County. 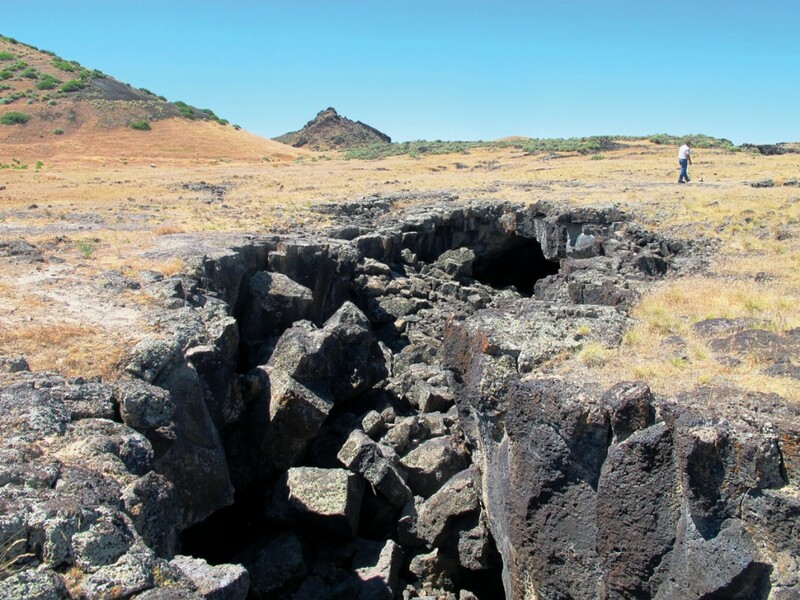 Episodic volcanic activity has occurred here from a couple million years ago up to a few centuries ago, leaving intriguing landforms and features including volcanic cones, lava tubes, pressure ridges, and craters. This article focuses on the northeastern part of the field, which includes Black Rock Volcano, Tabernacle Hill, White Mountain, the Ice Springs lava flows, Devils Kitchen, and Pahvant Butte, all easily identifiable from Interstate 15. The Black Rock Desert lies within the Basin and Range physiographic province, which has been shaped over the past 17 million years by stretching and uplift of the Earth’s crust. Extension resulted in development of faults in the thinning crust, creating a recurrent pattern of linear north-south trending mountain ranges and valleys. Some of the faults have been conduits for magma (and water) to reach the surface; many of the volcanic cones, vents, and hot springs in the Black Rock Desert align with the faults. Currently, the Black Rock Desert may be the largest geothermal prospect in Utah. The Black Rock Desert is the youngest volcanic field in Utah and contains both Utah’s youngest known rhyolite dome, White Mountain, and its most recent eruptive event, the basalt flows at Ice Springs. Two major eruptions—at Pahvant Butte and Tabernacle Hill—occurred when Ice Age Lake Bonneville covered the area, forming volcanic islands in the lake. Black Rock Volcano. About 15 miles south of Fillmore, the Black Rock Volcano—a horseshoe-shaped volcanic cone—rises more than 300 feet above the valley floor between I-15 and the town of Kanosh. Volcanic cones are built of material ejected and piled up around a central volcanic vent, forming a steep, conical hill. 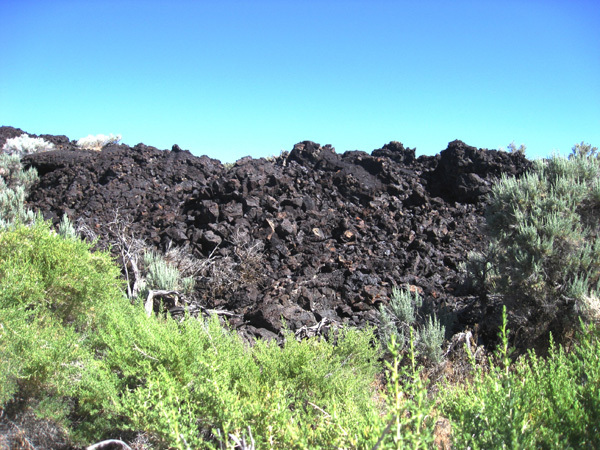 They are called “cinder” cones when made of loose particles of volcanic rock, and “spatter” cones when gobs of ejected molten lava partially fuse the particles together. The Black Rock Volcano is one of many cones of the Black Rock Desert that are a combination of the two, known as “cinder-and-spatter” cones. Tabernacle Hill. Tabernacle Hill is reached by way of Lava Tubes Road, named for the caves in the area. 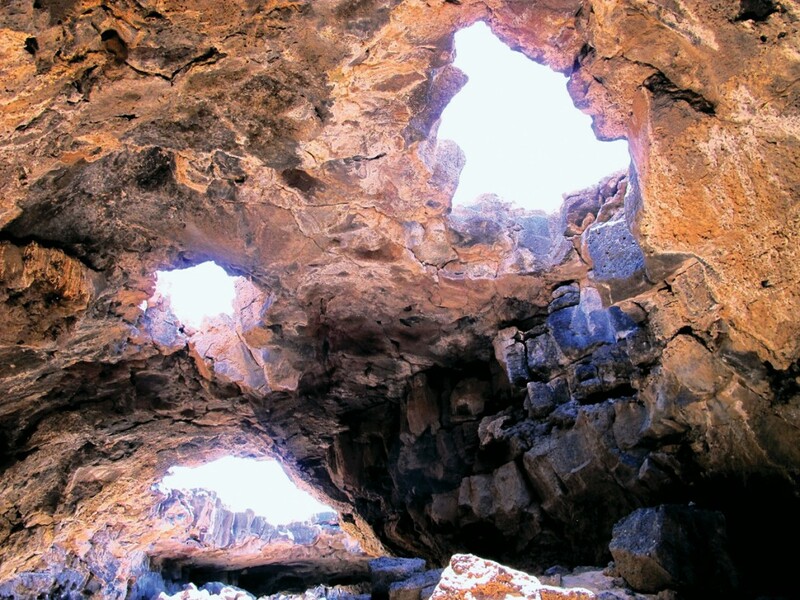 The lava tubes, which extend for hundreds of yards, formed as the surface of lava streams cooled, solidified, and crusted over. The subterranean lava then vacated the tubes as the supply of lava diminished, leaving behind empty conduits. The central tuff ring, from which Tabernacle Hill gets its name, is a type of volcanic cone made of ash and grittier fragments (lapilli) created by explosive eruptions caused by the interaction of basaltic magma and shallow water. Only two-thirds of Tabernacle Hill’s original 3,000-foot-diameter cone remains; the northwest side has been obliterated by eruptions. The central caldera within the tuff ring is surfaced with pressure ridges and domes, which are elliptical mounds that commonly split lengthwise along their crest as molten lava pushes upward on the solidified crust of the flow. White Mountain. At about 400,000 years old, White Mountain is the youngest known rhyolite dome in Utah. The dome gets its name from the bright-white wind-blown gypsiferous Bonneville sands draped across the volcanic protrusion. The 160-foot-high hill consists of rhyolite, which is more viscous than basalt and tends to pile up to form domes rather than spreading out in flows. At the dome’s base is glassy-black obsidian formed by the rapid cooling of lava, with frothy, bubble-filled pumice at the top of the hill. Ice Springs lava flows (The Cinders). The Ice Springs lava flows, also called “The Cinders,” were named for the natural icehouse conditions within the lava flows where ice and icicles can be found throughout the year beneath the blocky aa lava. Aa (pronounced ah ah) is characterized by its rough-textured, loosely piled and jagged appearance, and is notoriously difficult to travel across—sturdy hiking boots are recommended. Pahoehoe lava flows have an entirely different form, with a smooth, “ropey” texture. Lava flows can begin as pahoehoe and change to aa, as seen at Tabernacle Hill. The Ice Springs lava flows cover 17 square miles—dark volcanic rock so recently extruded that little to no soil or vegetation has yet taken hold. The flows originated from a cluster of four spatter-and-cinder cones. These cones, along with several others, churned out 700 million cubic yards of lava, one flow as recently as around 600 years ago, earning the Ice Springs basalt the designation of “newest rock in Utah.” People living in the area at the time were undoubtedly mesmerized by the advance of glowing, molten rock, and people may yet again see lava erupt here in the future. Devils Kitchen. North of the Ice Springs flows is Devils Kitchen, named for the hollow sound associated with its lava flow. In the days of horse and wagon when travelers traversed the flow, hoofs and wagon wheels vibrated the lava and the sound resonated through it, like tapping on a drumhead or on the flat tin roof of the devil’s kitchen. The Devils Kitchen fault forms a prominent escarpment for most of its length from the Ice Springs flows toward Pahvant Butte. The fault scarp is up to 60 feet high and exposes columnar basalt, characterized by vertically jointed columns, typically hexagonal and about two feet across, that form from the cooling and contracting of thick lava. Numerous boulders along the fault scarp have petroglyphs etched into the dark patina. Pahvant Butte. Pahvant Butte, also known as “Sugarloaf,” is a major landmark in the northern Black Rock Desert. A volcanic island in Ice Age Lake Bonneville that emerged from beneath the lake surface, Pahvant Butte has a wave-cut shoreline terrace surrounding most of the tuff cone that rises almost 700 feet above this ancient beach level. The upper part of the cone consists of palagonite, a yellowish-colored rock created from the contact of basalt lava flows with water. 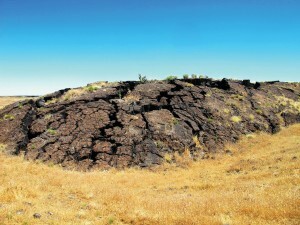 The northwest side of Pahvant Butte is draped in the peculiar cavity-filled “lace curtain” rock that resembles dripped wax (see article by W.F. Case in Survey Notes, v. 34, no. 1). 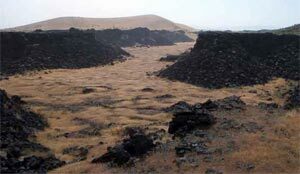 The southernmost part of the Pahvant Butte lava field disappears under the younger Ice Springs basalt flows. How to get there: There are many ways to access the Black Rock Desert volcanic field, most of which involve travel over unpaved but graded dirt roads. This selected route starts in Fillmore and goes west to Ice Springs, from where you can go north to Devils Kitchen and Pahvant Butte, or south to Tabernacle Hill and White Mountain. From I-15, take either Fillmore exit, then go down Main Street and turn west on 400 North (State Route 100). Cross the I-15 overpass (where 400 N turns into 500 N to Flowell) and go 5.9 miles to 4600 West (Pahvant Heritage Trail). At this intersection you can access the northern Ice Springs flows, Devils Kitchen, and Pahvant Butte by turning right and going north and west to Clear Lake Road, or you can access the southern Ice Springs flows, Tabernacle Hill, and White Mountain by turning left and going south and west along the perimeter of the Ice Springs flows to 2300 South. Tabernacle Hill and Pahvant Butte are classified by the Bureau of Land Management (BLM) as Areas of Critical Environmental Concern (ACEC) because they are unusual volcanic features and because of their important historic, wildlife, and scenic values. A visit to the BLM office in Fillmore is a good way to get information, directions, maps, and current conditions: 95 East 500 North, Fillmore, UT, 84631, (435) 743-3100.